As the Rune Witch Mysteries is coming to an end with Unbroken, the fourth and final installment out in January (Although, who knows, I may revisit Summer and Thomas in the future), I thought it might be nice to learn some more about the magic system Summer uses in the story. When I first started writing about Summer and Thomas it was for a short story in an anthology that I had been invited to take part in. This set, which is no longer available, was titled Rebels & Runes. So, I began by researching runes. You may have noticed that I like to set my stories in Wales. I’m Welsh, Wales is my home and when I learnt that Wales has the greatest number of stones inscribed with Ogham runes than any other country outside of Ireland, I knew I had found my magic system, one that already existed and had a very interesting lore behind it. I began to read a lot about the Ogham Runes and the trees associated with them. Yet, despite reading hundreds of articles and a fair few books, one resource I have gone back to over and over as a quick guide to their properties is a fabulous site by a lady called Avia. Avia has gathered a wealth of resources at What’s Your Sign, where there’s “a universe of information on interpreting signs and symbols” – one that I am sure that I will refer to for future books. The Ogham alphabet consists of twenty letters and a further five supplementary letters. The twenty letters, seen to the left, are the ones I used for Summer’s magic. In the books, I have used the Celtic names for the runes and not their Welsh names, as the Celtic names are more well known. 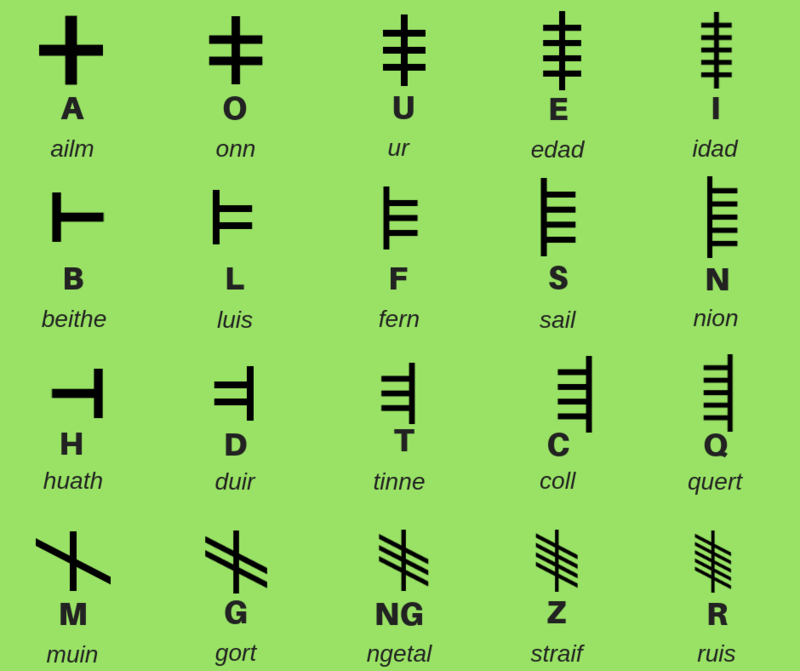 Each rune in the Ogham alphabet represents a tree and each tree has it’s own moon cycle covering 28 days. This starts with the Birch on 24th December, and follows with Rowan, Ash, Alder, Willow, Hawthorn, Oak, Holly, Hazel, Vine, Ivy, Reed and Elder. British Druids used the runes as a system to measure the cycle through the lunar months and as a celebration of the four Solstices. This passage of time is something I have tried to subtly incorporate into the Rune Witch Mysteries. Taken occurs in Autumn, Hidden in Winter, Forgotten in Spring, and the final story, Unbroken leads up to Summer – or more specifically, ends on Beltane, the Gaelic seasonal festival which marks the beginning of the pastoral summer season, you’ll see why when the book comes out 🙂 – This was the reason I decided from the outset that I wanted four installments. Summer has the twenty Ogham runes tattooed, ten in a circle around each arm. Just as ancient Britons used the woad plant to create a rich bluish-green ink to tattoo their bodies, so did Summer’s Nana, this accounts for the violet/indigo glow created when Summer ignites the power stored in her tattoos. Although Summer doesn’t need these tattoos to access the power of the trees, she uses them as a conduit to focus their magic. They also help her store their energy within her. Something which comes in handy when she and Thomas are attacked in the Brecon Beacons in Forgotten and they are too far away from any trees for Summer to gain power from them. 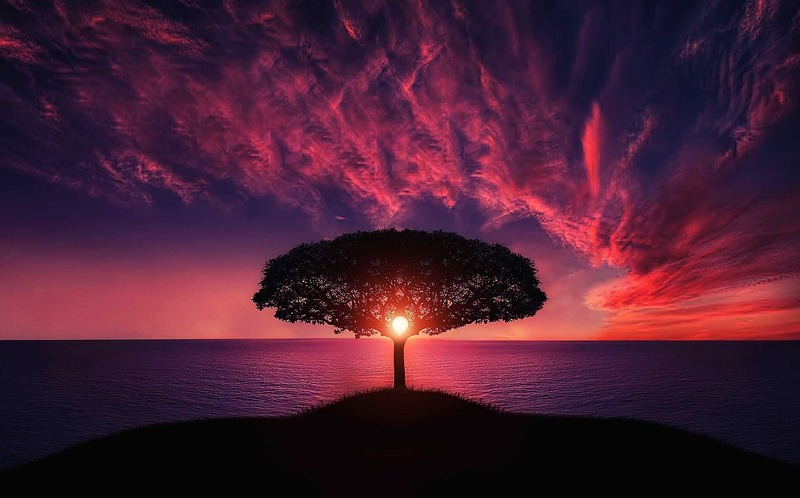 Avia has created a great resource on the Celtic Meaning Of Symbolic Trees over on her site, and with her permission, I would like to share a little of that here, along with the ways in which Summer uses the magic. Summer would use this tree to usher in a new beginning and bring luck to her adventures. Summer uses this frequently. It is used in the creation of Thomas’s protection wards and also when creating a location spell. She uses it for protection when forced to fight. In Taken, she also uses it to ensure a safe journey to the other side for the murdered bwbach and also when she needs to connect with Gwen’s mind. In Forgotten, she uses it when she needs to connect with the past and hear the words of the curse, when she projects her body when fighting the coven of witches, and when she creates a shield to protect her from falling debris. Summer calls on the alder for endurance and strength when she is forced to fight. She also uses the alder to help heal her leg when it is injured in Forgotten. Summer uses the willow when connecting with Gwen’s mind and when hearing the curse. She also uses it to connect with her memory of finding Lee Page’s body in the forest. She also jokes that it might come in handy in helping her visualise the spell to turn Thomas into a frog. Ash is another tree Summer adds into the mix when trying to connect with her mother’s memory and hear the curse. Hawthorn has a special place in Summer and Thomas’s hearts. When Summer first told Thomas of her magic, she “found the steady presence of the magnificent hawthorn and asked for its wisdom and guidance. The leaves shimmered in the gentle breeze, and a shower of fragrant blossom floated through the air like fairy wings. I called them to me, gathered them in an intricate posy, and then floated them over to an astonished Thomas.” She told him the tree had calming properties and that it would open his heart and provide him “with a doorway to another world” – of course, Thomas accepted the posy and entered the world of magic with her. Summer uses this a lot. She uses it to test the air around and read her surroundings. It is also is used when Summer needs to access her memory of finding Lee Page’s body, as it helps to manifest the memory for Gwen and Thomas to also see. Summer uses vine to enhance her psychic eye and protect her and Thomas when they are attacked in the Brecon Beacons. Summer calls on the ivy to blend dreams with reality and hide her and Thomas from prying eyes. Thomas also planned to use it in his proposal wreath to create a healthy bond. Reed is used in location spells to connect with the hair and guide Summer’s steps. She also uses it to connect with Lee Page’s memory and see the events of his death. Summer is often offered a cup of blackthorn tea to calm her nerves. It is also used when she needs to utilise Trystan’s power. Summer uses elder to connect with Lee Page and see the events of his death. It is also used when she is ensuring the safe passage of the murdered bwbach’s spirit. Summer uses the fir when she needs to heighten the clarity of sound around her. Summer would use this when she needs to impress people and get them on her side. I did debate whether to use it when she met the coraniaid but decided the creatures wouldn’t take it well if she tried to use magic against them. Heather is used when Summer needs to enter Gwen’s mind. Thomas also intended to use it in his proposal wreath for strengthening the bonds of soul mates. Summer debates whether aspen might be useful when joking about turning Thomas into a frog. She also used it when fighting Rachel Platt’s thugs to ensure victory. Yew is used in the repel spell activated by Thomas’s wards.